An outside legal review found a "perception of a culture at NPR that favors men," in a way that it said many employees believe "can foster harassment and bullying." An outside legal review of NPR's handling of allegations against its former top news executive, Michael Oreskes, found that questions were raised about his behavior toward women even before he was hired. And concerns about misconduct were reportedly flagged throughout Oreskes' 2 1/2-year tenure at the network right up to the day he was fired. Repeated warnings from the network's top leadership about Oreskes' inappropriate conduct and expenditures proved ineffective, the review by the law firm Morgan Lewis noted. "Attempts to curtail Mr. Oreskes' conduct and attention to women were not successful," the report stated. "While management made multiple attempts to counsel Mr. Oreskes about his conduct, he was not deterred from pursuing conversations and dinner meetings with women inside and outside of NPR that were inappropriate and served a nonbusiness purpose." Oreskes was forced to resign on Nov. 1. In an interview on Tuesday, NPR Board Chairman Paul Haaga compared the process of reviewing Oreskes to "whack-a-mole." "Remonstrations were effective in stopping one behavior, but not in stopping all behaviors that should have stopped," Haaga said. "We didn't know that he was going to solicit dates outside NPR." The nine-page report on the review's findings was released to NPR staffers Tuesday afternoon, as NPR CEO Jarl Mohn and Chief Operating Officer Loren Mayor had promised. Morgan Lewis conducted the review from December to February, interviewing 86 current and former NPR employees, 71 of whom are women. In effect, the legal review offered greater texture to Mohn's contention that he had failed to connect relevant dots — a contention he made in apologizing to the network's staffers in November. The law firm also surveyed the culture at NPR and found a "high level of distrust" in management to address such problems effectively. More broadly, it found a "perception of a culture at NPR that favors men," in a way that it said many employees believe "can foster harassment and bullying." Morgan Lewis suggested several fixes: NPR should require all employees to undergo sexual harassment training, preferably in person; NPR should contract with an outside firm to conduct investigations into sexual harassment complaints, at least for now, as a way of rebuilding trust; NPR's board of directors should monitor complaints, processes and resolutions; and NPR should conduct a gender equity study of pay and promotion. The network already appears to have embarked on several closely related initiatives under the leadership of Mayor. In its recommendations, the report also urges that hiring processes use blind references for job candidates. In a separate section on Oreskes, the report notes that he had four referrals and eight blind references. NPR journalists expressed anger toward Mohn and management at all-staff meetings held in November. Some questioned whether he could continue in the job. In a joint interview Tuesday, Haaga and NPR board member Wonya Lucas, who is leading the board's special committee on sexual harassment and workplace culture, said they retained faith in Mohn and his senior team. "There were clear lapses in judgment," said Lucas, a veteran cable television executive who is the president and CEO of Public Broadcasting Atlanta. "There was a breakdown in communication among senior management. There were policies and procedures that were not in place and others that were not followed." But Lucas said the current management team should be given the chance to succeed, given the work that Mayor has initiated and recommendations the board was poised to pass Tuesday evening. "People make mistakes. Some mistakes are so egregious that they are [professionally] fatal," Haaga said. "What I like to look at is, do they own the mistake? Do they learn from them? In a note to NPR staff on Tuesday, Mohn said he and senior staff are reviewing the Morgan Lewis report. "We can learn from it, and we will," he said. "While we cannot change the past, we can commit to not repeating it." Mohn added: "We are committed to a work environment where everyone feels safe and respected. I want to build an organization of equality and empowerment, where every one of us is held to the same standards and every voice can be heard." NPR News exchanged emails with Oreskes but did not secure comment. NPR News will update with any response from Oreskes. The problems involving Oreskes were flagged even before he took the job. At the tail end of the hiring process, one participant in his hiring review raised a past incident in which Oreskes reportedly sought to meet women late at night at a conference under the guise of discussing his book. Within six months of Oreskes' start in the spring of 2015, two NPR female journalists lodged sexual harassment complaints against him — each after attending separate dinners at which they alleged Oreskes had inquired pointedly about their personal lives and in at least one instance "made several comments of a sexual nature." Oreskes was warned about his behavior by NPR's top attorney, Jonathan Hart, who said it could not recur. The report suggests that the network did not receive new specific complaints of misconduct toward NPR women. According to the Morgan Lewis report, subsequent concerns were raised to NPR's top executives over his expense account submissions involving interactions with women. His digital exchanges with younger women outside NPR, including journalists elsewhere, freelancers, job hopefuls and aspiring college reporters, also set off internal alarms, according to two knowledgeable people. Colleagues said Oreskes used meals and drinks — ostensibly to discuss career advancement — as opportunities to engage in questionable conduct. Oreskes would be repeatedly admonished for his conduct and also over his expenses, by Hart, Mayor, Chief Financial Officer Debbie Cowan and ultimately Mohn himself. Oreskes has since reimbursed NPR for $1,800 in invalid expenses, an amount that seems modest in comparison with the amount of social entertaining he is said to have done. 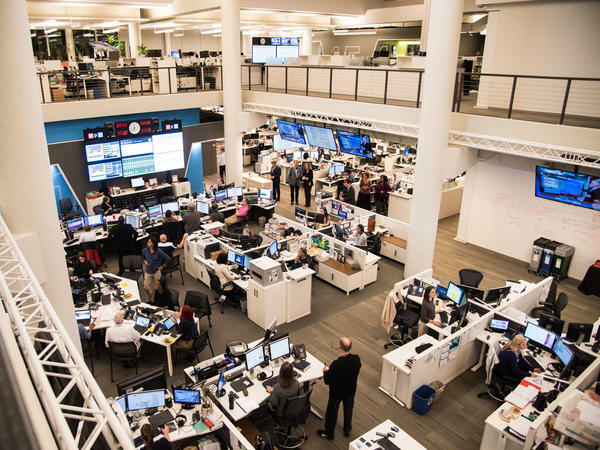 Inside NPR's newsroom in 2015 and 2016, rumors were swirling and more experienced female news staffers were warning younger journalists not to be alone with their top news executive. By fall 2016, editors were warning HR staffers and their superiors that Oreskes' conduct was inappropriate, though few had details to offer. At roughly the same time, a woman contacted HR to say that Oreskes had forcibly kissed her in the 1990s while he was Washington bureau chief for The New York Times and she was exploring job opportunities there. But these episodes were apparently considered as separately defined transgressions — inappropriate behavior toward subordinates; misuse of company funds on expenses; inappropriate conduct toward young female journalists who did not work for the network. In October 2017, a second woman reported that Oreskes had kissed her against her will in the 1990s while at the Times. The report suggests that only toward the end did Mohn and NPR's top executives conclude these incidents were part of the same family of misconduct. As a public matter, attention swiveled to Oreskes on Oct. 31, 2017, when The Washington Post revealed the two allegations from his days at the Times. Later that afternoon, NPR News reported one of the two HR complaints from an NPR journalist filed in October 2015. The same day as the Post's piece, another female NPR journalist notified the network that Oreskes had invited her to a beach cottage to discuss her possible career advancement. According to the report, that additional episode triggered the decision by Mohn to ask for Oreskes' resignation. On Nov. 7, in an email to staff, Mohn said he failed to connect other signs. "In retrospect, I did not see the bigger pattern of poor judgment and unacceptable behavior," Mohn wrote. "I am sorry, and I have learned from this." The report does not offer great detail for the individual episodes that occurred during Oreskes' time at NPR. Nor does it explain the internal deliberations of the network's leadership. It does suggest, however, two conclusions: First, the network failed to connect visible dots illuminating a related pattern of behavior; and second, NPR's management did not terminate Oreskes in part because, after the two October 2015 HR filings, it did not receive complaints about behavior toward women who worked at NPR until October 2017. Haaga, the board chairman, said Mohn should have been brought into discussions about Oreskes' behavior prior to fall 2016. And he said Hart, NPR's general counsel, was focused primarily on preventing harm to the company's employees. "It was surprising to me [to learn] when certain parties knew certain things," said Lucas, the NPR board member. "Different people within management had different information over time." More women came forward after media coverage of allegations against Oreskes. Other women subsequently told NPR News that Oreskes' behavior and communications made them decide not to apply for work at the network. Disclosure: NPR's David Folkenflik reported this story under the guidance of Deputy Managing Editor Jim Kane and Standards and Practices Editor Mark Memmott. Under standard procedures for reporting on NPR matters, NPR's corporate and news executives were not allowed to review what they reported until it was posted. No editors or reporters involved in this story attended any private NPR staff meetings related to the subject. We're going to take the next few minutes to talk about our own organization. NPR's board of directors has released an outside report that looks at a sexual harassment scandal involving NPR's former top news executive Mike Oreskes. He was senior vice president for news, and the report details how questions about his conduct were raised repeatedly, even before he joined the network. The review also found a perception of a culture at NPR that favors men. NPR media correspondent David Folkenflik is covering this story and joins us from our studios in New York. Hi, David. SHAPIRO: What did the report find Oreskes did? FOLKENFLIK: Well, it sort of fleshed out some of the details of what had been alleged previously. He had made multiple - there are multiple instances of him reaching out to women inside NPR, some of our journalists, and steering conversations into a deeply, profoundly and upsettingly personal level, in one instance at least a complaint where he explicitly talked about sexual matters. He was rebuked about that formally by NPR's chief lawyer Jonathan Hart back in October of 2015. And from that point, management thought, hey, that issue hasn't recurred. But there were other instances in which he was reproached. He was reproached for using NPR expense filings to try to be compensated for meals and drinks that they thought were social, nonbusiness in nature. And it turned out a number of cases involved women outside NPR. And they didn't sort of put those two halves together that, in fact, he might be continuing his behavior, leveraging his position at the head of NPR for women who might be seeking career advancement. This is an oversight that has really rankled a number of people inside the network. SHAPIRO: NPR's leaders have been criticized for the way that they handled complaints about Oreskes. What does the report say about that? FOLKENFLIK: Well, they said that they didn't make the connections. In fact, NPR CEO Jarl Mohn had said previously after forcing the resignation of Michael Oreskes back on November 1 that he failed to connect the dots. And they showed all the dots that were there. In fact, one dot occurred when questions were raised about his behavior during the hiring process in which he had behaved toward women at a conference. And there were a number of data points, points from almost 20 years ago involving a time when he was at The New York Times to more recently that one could create a more complete picture and say, why is this guy still helping to lead our newsroom? SHAPIRO: That's what NPR CEO Jarl Mohn said before. What did he say today now that the report has come out? FOLKENFLIK: Well, he's apologized before, he reiterated that. He said, you know, I can't undo what's passed. But in a note to staff early this evening, he said that he will do everything he can to not repeat the mistakes of the past, to make a - forge a better culture and to be very transparent in how he does it. And indeed, NPR has taken a number of steps in recent weeks, the last couple of months, to really change the way in which things are done here and in which things are perceived here. SHAPIRO: NPR's board is meeting tonight. What has the reaction been from them and what do you expect is in store? FOLKENFLIK: Well, they certainly say that they're disappointed, that indeed they acknowledge that this was not a successful effort to rein in the misconduct by the former head news chief. And at the same time, they say they have faith in Jarl Mohn and in his leadership. They say that they can see constructive steps taken to move forward, that they are poised tonight to vote on a series of policies and initiatives. And they also see, on Mohn's part and on the part of others, effort to keep faith and acknowledge that mistakes were made, to own it. In the words of NPR's board chairman. And that they think that this will be an opportunity to forge a better culture. One of the things that the board members stressed to me in talking - I spoke with Wonya Lucas, who was the head of a special committee for the board in looking at issues of harassment and culture - was the question of the culture, the question of how women perceive their station is and their status is here at the network even beyond the question of sexual harassment. The board members feel there's a real opportunity to reverse that sensibility. SHAPIRO: NPR media correspondent David Folkenflik - thank you, David.